“Saved, Single and Pregnant” from Christian Faith Publishing author Rosalind Frazer is an awe-inspiring book about her life journey, including the relationship, parenting, and health issues she has faced and conquered with the Lord’s help that gives hope to those who are disheartened and weary. “Saved, Single and Pregnant”: a touching work on how a person can be victorious in an imperfect life through addressing the root cause of problems with a courageous heart and acknowledging God’s sovereignty over all circumstances. “Saved, Single and Pregnant” is the creation of published author, Rosalind Frazer, the youngest of seven siblings and the mother of her only child, Damani, the pride and joy of her heart. She has served extensively in church auxiliaries, prayer teams, and several dance ministries as founder, director, and lead choreographer. Rosalind shares, “I believe one can become diligent in their efforts to deal with the core issues that linger in their hearts. In dealing with those deep issues, they would no longer need to carry this portable crutch in their bags, ready to pull it out at whim and helplessly lean on it because the battle is already lost in their mind. Renewing your mind daily by reading the Word of God, praying, getting revelation on deeply rooted hidden things in your lives, and dealing with them will help one win the seemingly hopeless battle in their heart, mind, and soul. Published by Christian Faith Publishing, Rosalind Frazer’s new book is a remarkably honest account of her gripping journey from experiencing feelings of shame, guilt, and condemnation while handling life’s trials and setbacks as a single mom to healing, deliverance, and restoration. She writes that each one must keep the faith despite the condemnation that haunts on a daily basis, because God is not finished working in each one’s lives yet until he calls him or her home. Believers should remember that he is a forgiving God who is always with them in every circumstance. View a synopsis of “Saved, Single and Pregnant” on YouTube. 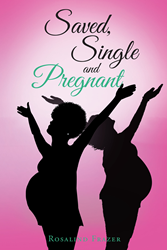 Consumers can purchase “Saved, Single and Pregnant” at traditional brick & mortar bookstores, or online at Amazon.com, Apple iTunes store, or Barnes and Noble. For additional information or inquiries about “Saved, Single and Pregnant”, contact the Christian Faith Publishing media department at 866-554-0919.